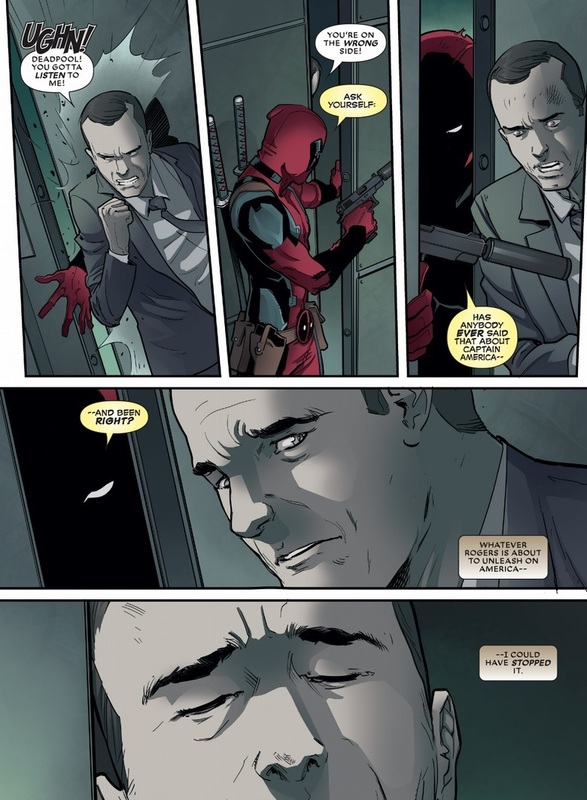 scans_daily | Deadpool #31: "Meifumadō"
Can "Cap helped me stay sane" be explained? What issues were these, and what part did Logan play? 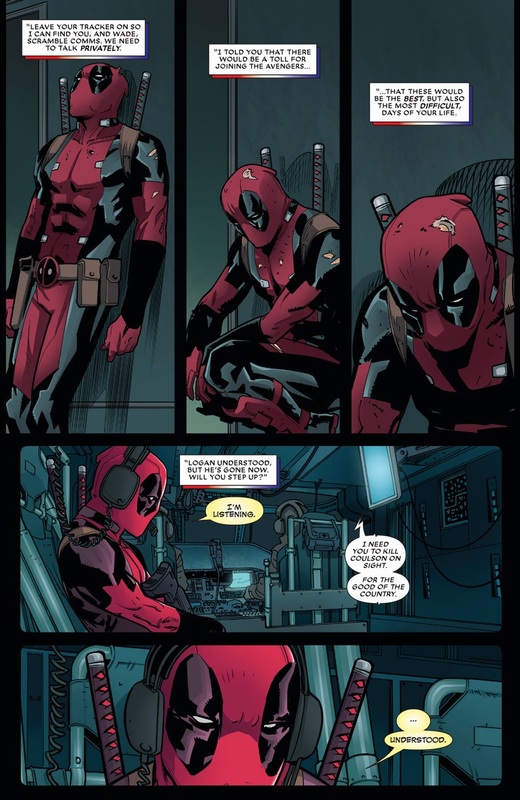 Deadpool 18 (2013): The Good, the Bad and the Ugly, part 4. 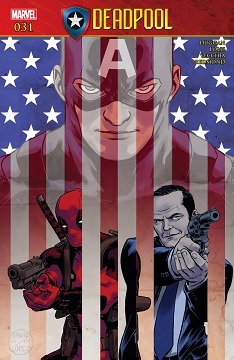 Cap, Pool and Logan liberate some North Korean prison camps, Wade finds a mass grave with a former lover in it and believes his kid is also dead. 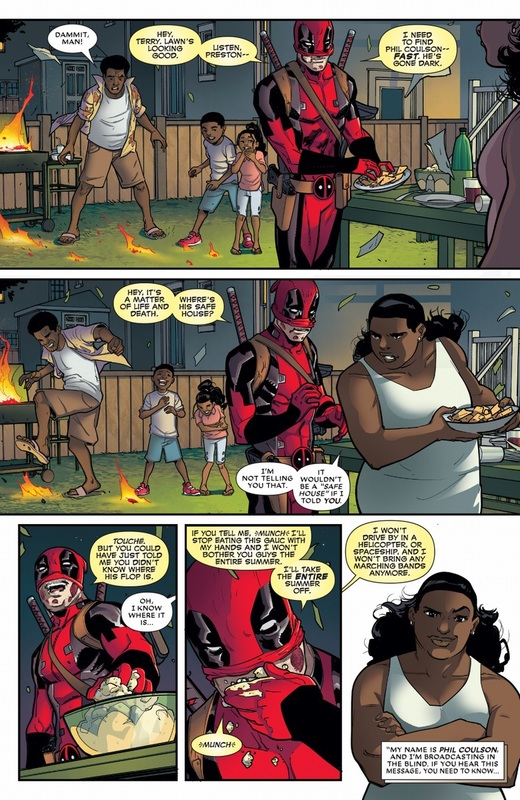 Jesus Christ, Wade. Don't eat potato salad with your bare hands right out of the bowl. Also, if he's joining up with Hydra, they'd better actually have him get some comeuppance when this is all done. I get sick of Deadpool at the best of times, but joining up with literal fascists should not be something he just jokes his way out of. actually most recent issue has shown that he's working the group from the inside. 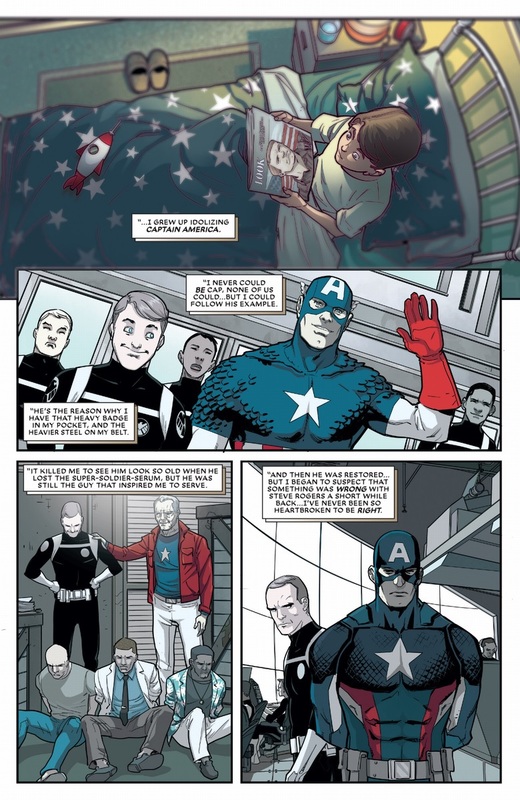 He Killed Phil under Cap's orders, but once the whole Hydra things started, he realized he had chosen the wrong side and now he seems to be playing double agent. 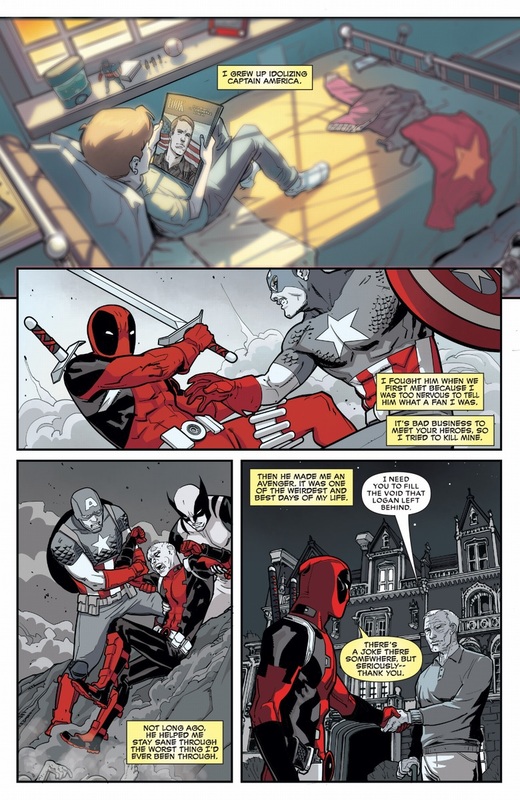 Huh, and I thought Deadpool fought Captain America the first time they met because Cap was possessed by an evil cosmic entity bent on subjegating the free will of every being the universe. 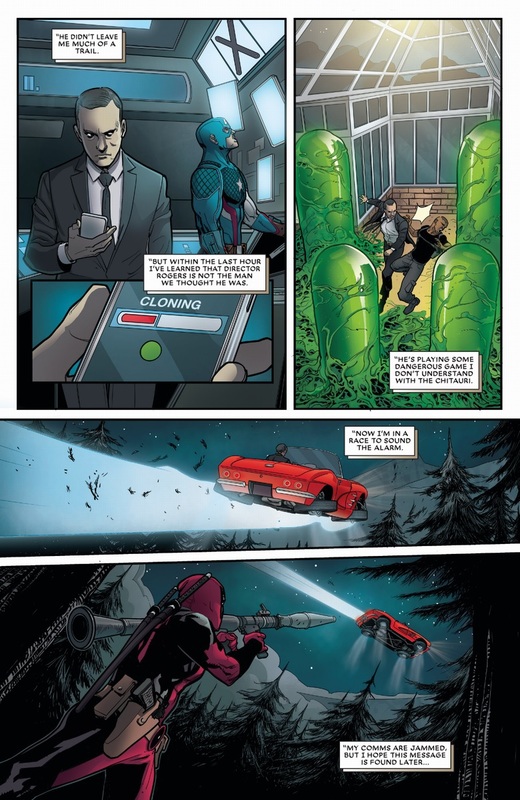 Well, also that, but Deadpool's memory is like a 20-year-old VHS tape. I literally have no emotion or reaction to Coulson dying. Like I'm actually happy. I think its good. I'm like "Oh. Okay"
He got better from dying on Agents of S.H.I.E.L.D. So eh. To be fair, the mind control trope is usually less successful than this. Usually it's an immediate threat/takedown situation, rather than a stealth operation that lasts months and culminates with the character taking over the whole country. His Nazi good looks are distracting. Because they don't just hand those chins out to just anybody. It is easy to forget how ruthless Wade can be when he isn't cracking jokes. Agreed. He's probably the only character with a hyperactive healing factor that's smart enough to always use distance weapons. Oh no. A beloved super hero character has died. Let me think of a good eulogy for him: "See ya real soon?" No, wait: "Enjoy Tahiti; its a magical place". 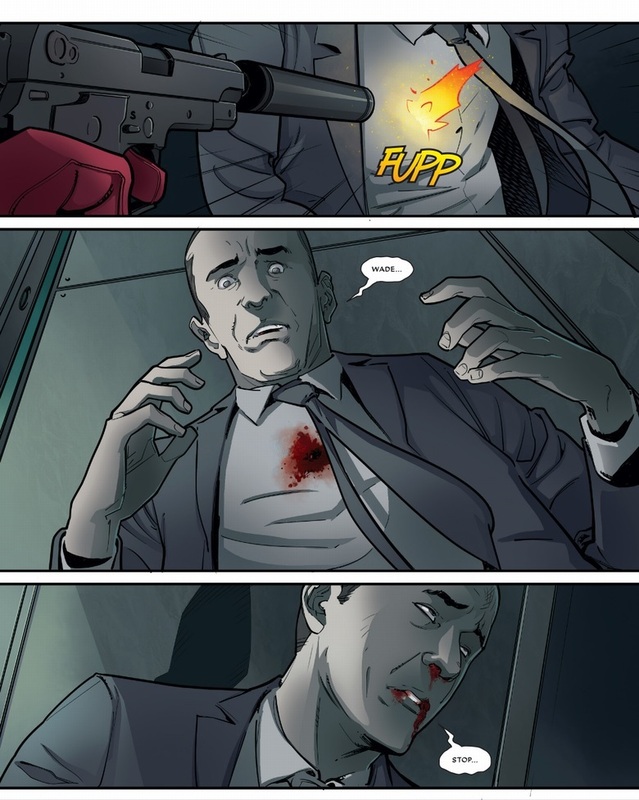 Coulson's whole deal is he doesn't stay dead. I'm sorry, but I'm having trouble feeling emotion over the death of a guy whose gimmick is he doesn't stay dead. To be fair, it's only a gimmick if it happens more than once. Also to be fair, Coulson isn't a super hero. ...I don't know what the over/under is on that. Wow, Wade brutality murdered an LMD in what appears to be an alternate reality (I am not letting the Strong Guy thing go). Was the Strong Guy thing pre Secret Wars? Because then technically it is an alternate universe, as all realities were destroyed and remade then. The fact is that Secret Wars gives writers a blank check to ignore whatever previous stories they like as long as they haven't been re established afterwards. What thing about Strong Guy now? He just showed up in the main SE series without explanation. It wasn't the main SE series. It was, well, two places: The SE: United one-shot and SECRET WARRIORS. Though they're technically following a precedent: He'd already shown up without explanation in Inhumans Vs. X-Men... which, oddly, was co-written by the *same writer* who'd written his previous appearance before that, where he was still in Hell. What's up with that, Charles Soule? I expect that they will go with the a lazy Secret War reset handwave if they bother to explain it at all but I still think ignoring this writers work on an X-Factor character is a mistake. Ah, okay. I thought that someone had retconned his last couple of appearances. ok. the parallel between the two broke my heart... but I feel like maybe he WILL actually bring Phil back to life... maybe using Wolverine's blood?